EDIT: Giveaway is officially over. Congratulations to Tina Ivanisevic for submitting the randomly chosen 879th entry. 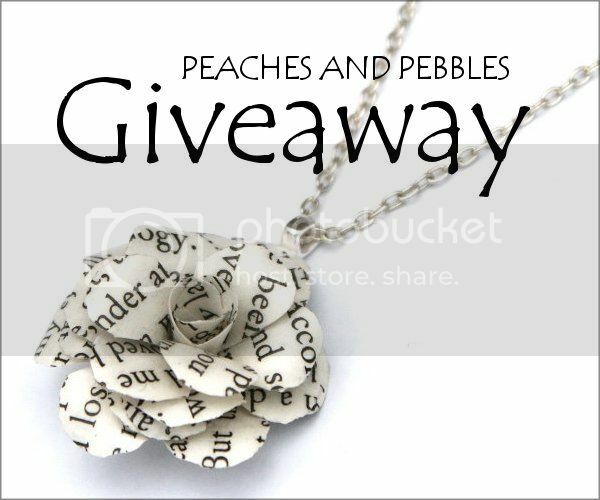 Books, flowers and pirates are a few of my favorite things ... and Kim of Peaches and Pebbles has combined all three into one paper rose necklace, upcycled from pages of Treasure Island. Stroll through her Etsy shop to see which of your favorite things she's crafted into jewelry and you just might win a $30 gift card to pick your own prize. Have a favorite animal? Adopt a glass jar necklace with a miniature pet inside. Or perhaps a favorite dessert? Feast your eyes on a chocolate donut ring or rainbow cake bookmark. She crafts the cutest things! In addition to being a jewelry artist and a caregiver for her mother who suffers from Multiple Sclerosis, Kim is also aspiring to be a published fantasy author. She writes about her hunt for a literary agent on her A Blackbird's Epiphany blog. Just imagine, someday crafters could be upcycling her wonderful words into wearable art like she's doing with Robert Louis Stevenson's classic novel now! Use the Rafflecopter below to enter to win gift card sweepstakes before 11:59pm EST on August 20, 2013. Be sure to leave the mandatory comment on the blog post with the same name you use to fill out the Rafflecopter - all entries by winner must be easily verified or a new winner will be chosen. Not including usernames when asked will also get you disqualified. My favorites are the paper rose necklace (I'm a read-aholic) and the heart in a jar necklace! I am a big bookworm so obviously I love the Book Page Flower Necklace! This is my favorite! But I also love the ring! My favorite item from the etsy shop are the Yellow Nebula Universe Earrings. They are beautiful. I like the Blue Butterfly Friendship Necklace ChristmasInJuly Best Friend, Blue Morpho, 16 inch chain......ciao4now64 at yahoo dot com. I like Mint green Thread Necklace. I love the Blue Black Nebula Ring. I am so in love with the floral birdhouse gift set. Blue Black Nebula Ring - image of part of the Orion nebula set beneath glass on an adjustable ring. I love the Book Page flower necklace, but I like the lollipop items too. I'm loving the Book Page Flower Ring!!! Love the Pastel Peach Thread Necklace. My favourite item must be the Brown Letter Envelope Necklace. Those kind of envelopes have a very special meaning for me. I like the Floral Birdhouse Necklace ChristmasInJuly Cottage Chic, Whimsical, 16 inch chain. in love with the heart in jar necklace. so cute!!! I like the Miniature Hobbit House Necklace - Tolkien - miniature hobbit or fairy house with a green door inside a glass jar, on a 16 inch chain. I love the dusty rose flower necklace (perfect for an English teacher like me). I very much love the Letter Envelope Necklace! Can it be any cuter? I love the Dragonfly Wings Jar Necklace - Fall Autumn Lake two faux dragonfly wings in a small glass jar. 16 inch chain. Oh My!! I LOVE Typographer so of course my favorite is that Book Page Flower Necklace Ring Gift Set!!!!! The book page flower ring is awesome and the perfect gift for one of my literary friends. The Pink Universe Nebula Earrings - two parts of the NGC 2264 region set beneath glass on silver plated studs is my favorite. It's so pretty. Love the Floral Birdhouse Necklace Fall Autumn Cottage Chic, Whimsical, 16 inch chain! so many amazing things! :) i really love the book page flower necklace, with the blue black nebula ring coming in a close second! wonderful giveaway- thanks so much! I love the book page flower necklace, books and roses are two of my favourite things! I just adore the book page flower ring! I love the book page flower ring/necklace and the tiny badger in the jar! I love the book page flower ring. if I win the necklace I will buy the ring. thanks for the giveaway. Chocolate Chip Cookie Necklace Gift Set. There are so many to love but I think my favorites are the animals in the glass jars. If I win I think I will buy my daughter either the arctic fox or the Greg seal. The birdhouse ring and necklace are so great. I like the Book Page Flower Ring. I love the Book Page Flower Necklace Ring Gift Set - flowers made from book pages as both a ring and a necklace - matching set!! I'm a big reader and this is a cool idea! I love everything! But I really love the Floral Birdhouse necklace. So cute! I like the little birdhouses, but my favorite is the book page rose necklace. I would give it to my daughter who is a writer and a big fan of the classics, like Treasure Island. I love the Yellow Universe Fire Nebula Ring, very cute & unique! My favorite item is the Dragonfly Wings Jar Necklace! I love the Hobbit House necklace! My favorite item is the Book Page Flower Necklace - Fall Autumn - Judith R.
I adore the book page flower necklace!! I like the Dusty Rose Nebula Ring ChristmasInJuly best. I really like the Book Page Flower Ring. I love the Tiny White Snowy Owl Necklace. I like the Floral Birdhouse Gift Set Autumn Fall - Miniature birdhouse necklace and matching ring set. The 'Arctic Fox Jar Necklace' is adorable! I love the Miniature Hobbit House Necklace - Tolkien - miniature hobbit or fairy house with a green door inside a glass jar, on a 16 inch chain. I love the Floral Birdhouse Necklace Fall Autumn Cottage Chic, Whimsical, 16 inch chain! The Polar bear in a jar necklace is just adorable! My favorite item is the Heart in a Jar Necklace! I love the Brown Envelope Necklace. What great items! I will be back for some holiday shopping for sure! My favorite item is the Miniature Wolf Jar Necklace. So awesome! I love the Letter Envelope Necklace Miniature Tied With String - Cream Colour! It's so cute! good luck to everyone but to me especially!! I love the Book Page Flower necklace. I love the Fox in the Jar, its so adorable!! especially the pink one, i love your etsy page! White Boho Woman Silhouette Necklace is great! I like the Book Page Necklace and Ring Set. My favorite is the Tiny Horned Owl Necklace. I like the book page flower necklace and the bear in a jar. It's so hard to pick just one favorite! I love Black Rivet Leather Stand Collar Scuba! I love the envelope necklace! Love this: Book Page Flower Necklace Ring Gift Set - flowers made from book pages as both a ring and a necklace - matching set! The book ring (Book Page Flower Ring - eco whimsical ring made from the pages of a book on an Adjustable silver tone Base) is definitely my favourite - I can see why it is a featured image. I love my books, this jewelry just makes sense!